THE SEPTEMBER 12 CIVIC ENGAGEMENT WORKSHOP HAS BEEN CANCELED AND RESCHEDULED FOR SEPTEMBER 19. On September 19, the Murray Center invites you to the Moral Revival Mass Meeting. Join us to hear about The Poor People's Campaign, a movement to end systemic racism, poverty, militarism, environmental destruction and related injustices. You'll learn from leaders of the national movement about how to apply this new model of civic engagement to make a real social impact. Click here for details on the Capacity Building Series. For more information and to register, contact Rev. 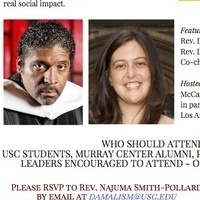 Najuma Smith-Pollard by email at damalism@usc.edu with your name, organizaion, and phone number.